PORTLAND, Ore. – With two second-place finishes at Portland International Raceway, Rinus VeeKay has secured the 2018 Pro Mazda Championship Presented by Cooper Tires championship title. With the results in Portland, the 17-year old has tallied 7 wins and 10 podiums in 2018 en route to also capturing the Rookie of the Year title. “Wrapping up the [Pro Mazda] Championship in Portland feels amazing. I came into the weekend with the lead in the championship and all I had to do to secure the title was start the first race. I ended up getting both pole positions and finished second in both races, which made me the champion. I am so happy right now." The Hoofddorp, Netherlands native driver started his championship run with a double win on the streets of St. Petersburg, Fla, but it wasn’t all smooth sailing for the talented Dutchman. While showing great consistency at the following rounds at Barber Motorsports Park, the Indianapolis Motor Speedway, Lucas Oil Raceway and Road America, the top step of the podium would elude VeeKay. 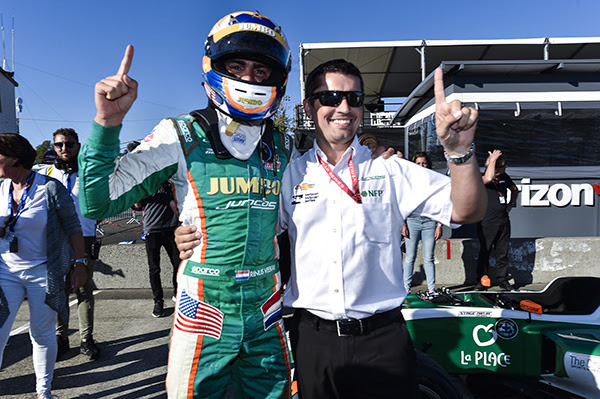 The month of July would solidify Juncos Racing and VeeKay as championship contenders with a pair of wins on the streets of Toronto and a weekend sweep at the Mid-Ohio Sports Car Course. The four-race swing would put the Dutchman in the championship lead going into the final oval race of the season at Gateway Motorsports Park on August 25. Leading all 55 laps of the race secured the victory and a commanding 47-point lead in the championship. The weekend in Portland started in the best way possible with a double pole position effort for the teenager. In Race One, VeeKay was relegated to third at the initial start, but he quickly made his way back to second, a position he would hold until the end of the race, securing the championship title with one race to spare. In the final race of the season, VeeKay again would secure the second position early on in the race and continued to hold that position until the checkered flag. With the Pro Mazda Championship secured, VeeKay will move up to the top rung of the Mazda Road to Indy, Indy Lights, in 2019 thanks to a nearly $800,000 scholarship from Mazda.